Dean and Julia Harmon have been residents of Billerica since 2001. Dean is a software engineer and Julia a music teacher in the Billerica public school system. 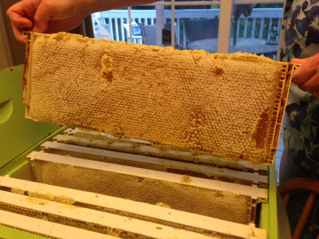 In 2014 they decided to keep bees after noticing their garden was not producing as well as it should. Their apiary, although small, has been blessed with a bountiful honey crop due to the meticulous care that they are able to devote to their hives. Harmon’s Heavenly Honey is harvested in June, August, and September. Each harvest has a distinctly different color and flavor that changes due to the unique flowers that bloom in each season. The lighter the honey is, the sweeter it tends to be. The darker the honey, the more antioxidants it boasts, but is not as sweet. After pulling the frames of honey, each is first uncapped and then extracted by spinning the honey out of the frames using a large centrifuge. 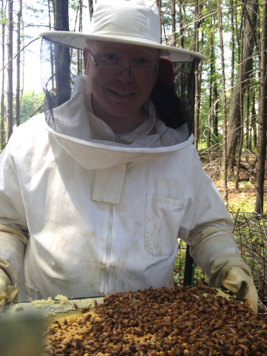 The honey then slowly flows through a strainer and into a 5-gallon bucket. 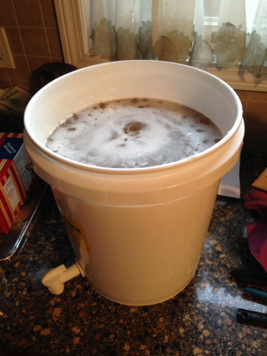 Once extracted, it must rest in the bucket for a week to let the air bubbles float to the top. At that point it is ready to be bottled and sealed.